Enter Stage Right :: Order now ! 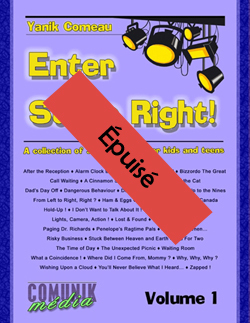 You wish to order Enter Stage Right !, our collection of 36 short plays for kids and teens? You've come to the right place! Since shipping costs are very high, we no longer offer our books «Coups de théâtre ! 36 courtes pièces pour enfants et adolelscents» and «Enter Stage Right! 36 short plays for kids and teens» in paper format outside of North America. However, they are available in numeric format through our website theatralites.com .  You can pay through your PayPal account (opening an account is free, and all transactions are, too!) with your credit card or an online secured bank withdrawal. As soon as we receive your payment (which you can make in your own currency), we'll send you your book(s). Click on the Paypal button under the book on the top of the page.  Check out our order form and e-mail us all your info at commande@comunikmedia.com .  Call us at 514-766-5551 and we'll take your info over the phone. We speak both English and French. Here's to creating beautiful theatre productions with you! * If your school, district or school board has strict rules about using its own order form, no problem. Please make sure you include all the info we need by checking out our order form. Thanks!